Sports fans know that loyalties run deep, and there’s no question of giving your opponents any kind of edge. So if you live in Pittsburgh and love hockey, you won’t be surprised to hear that a bar there is banning Sam Adams beer while the Penguins are playing the Boston Bruins in the Eastern Conference Finals. This, because beer and hockey go hand in hand and rivalries don’t have any room for confusion of loyalties. Better drink that traitorous brew while you can, Pittsburghians (Pittsburghites [ed. note: reader says it’s Pittsburghers or Yinzers, awesome]?). 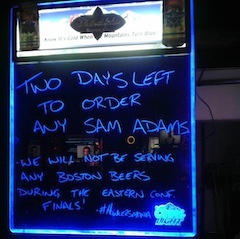 Yahoo!’s PuckDaddy blog points to a Pittsburgh bar that is most definitely taking the Eastern Conference Final between the Pittsburgh Penguins and Boston Bruins seriously, and as such has warned its patrons on its Facebook page that as of Saturday, no Boston brewed Sam Adams will be served. As one of our observant Consumerist readers points out, this isn’t the first time Sam Adams has been on the receiving end of such a ban — during the 2012 Super Bowl between the New York Giants and the New England Patriots, a New York sports bar also abstained from serving Sam Adams. In any case, if you’re heading to that bar you better drink up now. You’ve only got two days to think of a suitable alternative, after all.